While Islamic Revolutionary Guard Corps (IRGC) has warned the opposition not to hold protest on 4th of November, Iranian people prepare for huge rallies against dictatorship. 4th of November marks the anniversary of US embassy seizure. 30 years ago, students grabbed the embassy, but now students have changed significantly, so this time in the memory of that day they want to sent peaceful message to the world. 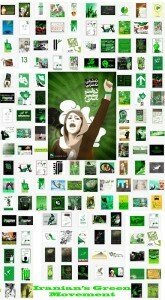 As a result, the internet received massive artistic posters that are expressing Iranian’s thought, moreover these posters are aimed to encourage people to get together and protest dictatorship and discrimination, and stand for equality and human rights. Besides, huge amount of blogs are trying to express their opinions about the current condition of the Iranian society, an important number of podcasts have been published online about 4th of November. Facebook and Youtube are filled by clips, images and notes in the memory of those killed during the post-election’s protest. In contrast, prominent politicians and the IRGC warned the opposition and the people not to hold any other protest except the one that is against the US. In the meantime, government tried to put the mainstream media under pressure as recently one of the Iranian newspapers has been banned with unclear reasons. IRGC pointed out that, people should be careful not to stray from the fundamental governmental policies. According to IRGC, the opposition is induced by foreign governments such as US and other western countries. The Iranian regime send a warning, on the IRNA state news agency, that it would be not tolerate any “diversionary and false” slogans. However, opposition’ leader Mr. Mousavi and Karobi are still encouraging people to come out and stand for their basic rights. Moreover, there are too many actions that came out from universities and even high schools in order to support Iran’s green movement. Universities’ movements activated largely after one of the students from Sharif University shouted over dictatorship in front of Ayatollah Khamenei in a meeting. The atmosphere within academic sphere in Iran such as universities and high schools is convulsive as with many protests. In addition, 4th of November is also called students’ day.